Supporting those customers who often request help at 2:00 am in the morning, or even customers who lives in different countries throughout the world with different time zones can be extremely hard to manage. At Trakdesk, we've taught of this issue and came up with a brilliant solution, using multiple business hours. 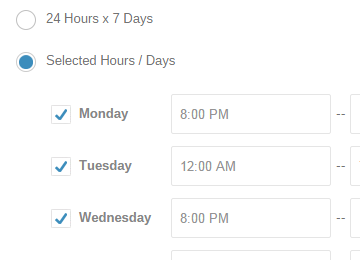 You can create multiple business hours; configure business operational hours and setup holiday’s exclusions. You can then assign them to specific SLA policies, configure targets and setup SLA violation notifications for each so nothing slips through the cracks. Trakdesk allows you to setup multiple business hours and assign them to specific SLA policies and agents so that your customer issues will be taken care of on time. For example, let's say Rob is on call for the week and is responsible for all the late night support requests. You can setup a business hour with hours of operation from Monday to Sunday, 8:00 pm - 7:00 am, and assign it to an SLA policy, then, configure email or SMS SLA violation notifications to be sent to rob. Holidays are pretty much exclusions to your business hours, the days as to which your business is closed and not operational. For example, let's say today is a holiday and your business is closed. If a customer sends in a request for help, the ticket respond and resolved within time will be calculated based on the next working day. 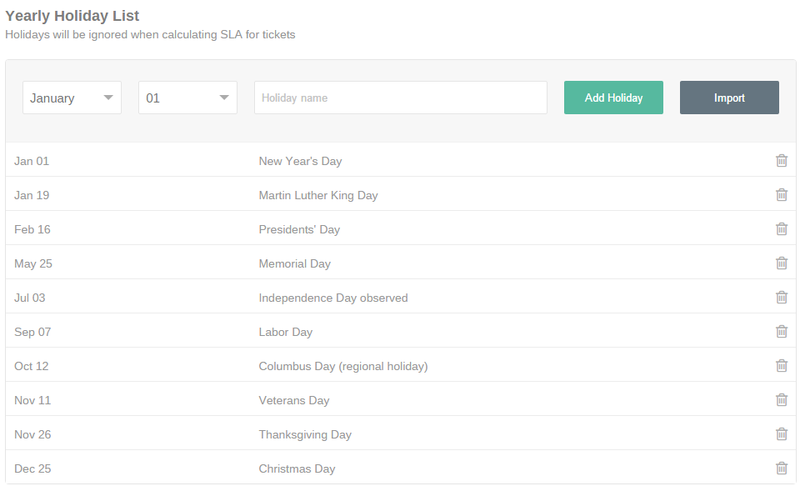 With Trakdesk, you can manually add holidays to each of your business hours or you can simply import all the holidays for your country at once using the holiday import feature.